Chainmaille can be incredibly intimidating - especially to a beginner. There are a lot of numbers, math equations, and plenty of vocabulary words to learn. One could probably --no, definitely teach a course on the topic! Our FAQ is here to answer your most common questions, from newbie to novice, we've got some great info below that we hope will make you more confident in your chainmaille excursions. We promise we won't test you and if there's something not answered below - please feel free to contact us on chat or give us a call. We will continue to add to the FAQ over time. How many rings are in an oz or troy oz (ozt)? What ring size should I use? Do you have free tutorials? Can I request different colors in a kit? Can I make my own mix of colors? Custom Rings Sizes/ Do you make other sizes than what you have listed? What size rings do I need for my chainmaille pattern? How do I redeem my Lair Loot Points? A. Imperial refers to jumprings measurements in inch increments - 3/32", 1/8", 5/32" and so on. A. Metric refers to our jumpring measurements in millimeter increments. 2.75mm, 3.0mm, 3.25mm, 3.5mm and so on. Q. What is the difference between Imperial and Metric? A. There is no direct translation from imperial to metric. You can use google to translate millimeters to inches. If you line everything up side by side on a chart you'll see that 1/8" is not 3mm. 5/32" is not 4mm. 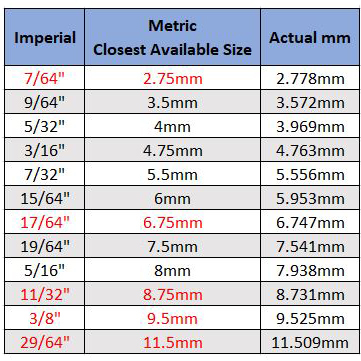 Here is a chart that shows our CLOSEST available sizes from imperial to metric. Note the actual mm size that translates from an imperial size is listed in the last column, those sizes we do not make. Any size listed in red is a size we can custom make. There will be an additional charge for these sizes. We cannot make sizes listed in red in anodized aluminum. You must order a minimum of 1 oz in order for us to make these rings. Q. What is the difference between AWG and SWG? Q. What is Aspect Ratio? A. Aspect Ratio is the measurement of a ring as follows: MM ID / Wire Gauge. That's millimeter inner diameter divided by wire gauge. All Weave Got Maille Jump Rings are listed by their inner diameter. A 16g 5mm WGM ring has an Aspect ratio of 5mm/1.2g = 4.1AR. So who cares about Aspect Ratio? We do! and so do most maillers, finding the proper aspect ratio can let you know whether or not a specific ring size will for for a project. You can look at our suggested weave size charts, or you can calculate AR yourself to match the AR of the rings we've listed - NOTE: This equation does not account for real world differences such as manufacturing variations, material "spring back", or Murphy's Law. This equation is a guideline at best. Always verify final AR with us first, or manually with a caliper. Q. How many rings are in an oz or troy oz (ozt)? A. We have charts with our rings per oz and rings per troy oz (ozt) listed here. If there is a size you are purchasing that isn't on the list, such as a custom size, feel free to contact us and we will weigh them out for you. Q. What ring size should I use? A. We have charts that list of recommended millimeter rings sizes for many weaves listed here. The rings sizes we list are not the only sizes that can be used for each weave. These are our preferred sizes and have been tested, and therefore we can verify that they will work. If you want a weave in a larger size you can check the maille artisans website to see what they recommend. Q. Do you have free tutorials? A. We currently have one free tutorial. All of our other tutorials are $5. Many hours both creative as well as laborious go into creating our tutorials. We need to compensate our designers, and the creator of the tutorial. Each sale go towards these hours. Q. Can I request different colors in a kit? A. We do not swap out colors in kits. We do list what sizes are used in our non-guest designer tutorials and invite you to purchase individual ring packs to create your own kit colorway. Q. Can I make my own mix of colors? A. Yes! You can purchase smaller pack sizes and them mix all your rings together. We use equal parts of each color within a mix. Q. Do you make other sizes other than what you have listed? A. We list our most common sizes up to our largest mandrel. If you need a custom size please contact us and we will see if we can make it for you. There will be an additional charge for custom rings. Custom made rings are non-refundable. Any promotions or special discounts cannot be applied for custom orders. A. Springback occurs when wire is wound around a mandrel and then the coil relaxes. Think about winding a twist tie around your finger, often times it won't stick tightly to your finger once you let go of it. This same occurrence happens with certain metal wires when creating jump rings. Aluminum is known to have springback, but the wire that we carry that has the most springback is stainless steel. Larger inner diameter rings (think 6mm+) have more springback than smaller inner diameter rings. The rings at the middle of a coil are going to have less springback than the rings at the ends of a coil. We try to keep the springback at a minimum but it is very hard to control. If you are looking for a true inner diameter, your best bet will be to try our copper or enameled copper rings. If you are concerned about springback in a size you plan to order please contact us. Q. Custom Rings Sizes/ Do you make other sizes than what you have listed? A. We are able to offer custom jump ring sizes for any metal except anodized aluminum. We are working towards adding more sizes in anodized, but this takes time. Please contact us for a quote & order minimums in any other metal we offer at info@weavegotmaille.com. Q. Do you have a discount program? A. Yes we do! In order to become a wholesale customer we ask that you own your own bead store. Your store may be either brick and mortar or you may own your own website as a jewelry supply company (this excludes Etsy, Amazon, & the like). We also require proper documentation as proof of owning/ representing the store. We understand the desire to find a supplier to sell wholesale to you, as your needs for low cost supplies are great. That is why we created a Volume Discount Program, specifically with designers in mind. By buying though our website and using our volume discount coupon codes you are allowed to shop our entire inventory whereas wholesale bead stores have a more limited inventory as well as minimum yearly requirements to meet. Q. I forgot to use my coupon code! Can you honor it? A. If you forget to enter a coupon code into your order during checkout we can honor the coupon code in the form of store credit. You MUST contact us within 24 hours of placing your order. We can only accept one coupon code per order. This includes Lair Loot coupons. 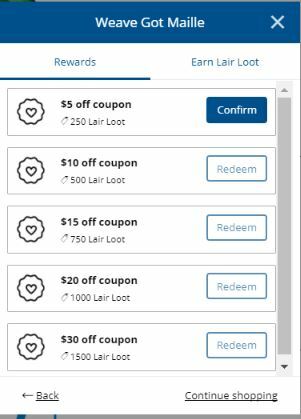 You may either use a current promo coupon, or a Lair Loot coupon per order. Q. I can't find the place to enter a coupon code on a mobile device. Where is it at? A. After you have all of your items in your cart, click on the "Proceed To Checkout" button. Look for this floating bar on your screen and select the show details. This should take you to a place to edit your cart. Click on the coupon code/gift certificate link and a box should appear where you can enter the coupon code. Q. What metal is that? A. We carry a variety of metals, if you need a specific breakdown for a metal please see the individual jump ring pages. None of our metals contain: Lead, Nickel or Cadium. Q. What size rings do I need for my chainmaille pattern? A. We have a weave chart available that lets you know what size you can use for some of the most popular chainmaille weaves. This chart lists what size we have used in metric inner diameters using our rings. We do not list sizing for imperial rings at this time, but you can always contact us and we will have a suggestion. Q. Do your rings tarnish? A. Many of our jump rings will inevitably tarnish naturally with time. This is especially true with Nugold, bronze, copper, sterling silver, Argentium and silver filled. We have an extensive blog on keeping Nugold bright and shiny. We also have Sunshine polishing cloths available for shining up your tarnished pieces. Tumble the following metals in cold water: nugold, copper, bronze. Tumble the following metals in hot water: stainless steel, sterling silver, silver filled, Argentium, niobium. Q. How do I redeem my Lair Loot Points? A. Once you have accumulated at least 250 points a redeem button will will appear next to the available discount. Click Confirm. Once you confirm a coupon code will generate. This is the coupon code you will place in the coupon area during the check out page. You will also be emailed a copy of this coupon code to use.